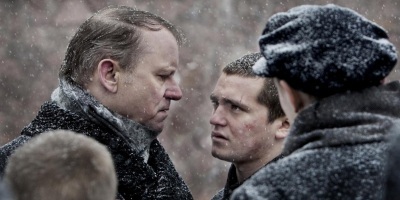 Set in the cold, desolate Norwegian winter, King of Devil’s Island depicts the terrible conditions that the boys at the Bastøy Reform School for “maladjusted youths” (read: prison) had to endure, before a newcomer becomes the catalyst that eventually leads them to rise up and overthrow their abusers, taking control of the island in a violent rebellion. It’s a devastating tale – all the more so for being based on a true story. According to Holst, however, the story isn’t well known in Norway. “I had a chance to meet a guy who was there in the mid-30s. He told me his story. That made me think there was a film there. I started to research it, found out about the riots and military involvement – which isn’t widely known in Norway. I didn’t know anything about it – and I grew up an hour and a half from the island!” Given that the Bastøy rebellion was one of only two instances when the Norwegian military had to take action against its own people, it’s incredible to think that the story isn’t well known. Holst’s film has changed all that, however. “It got a lot of attention in the media. Everyone started writing about Bastøy as an institution. That hasn’t really been talked about for decades. 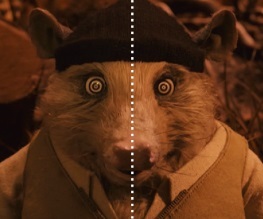 There was criticism at the time of the events in the film. It did have a bad reputation. But the way they saw it then was, thank god the military came in and restored order! They weren’t thinking about why the kids reacted like they did. They thought “here we put these boys on an island, we spend money to help them, and they attack state officials and destroy property”. That’s how it was seen. The soldiers were the saviours of the people who ran the island; the boys were looked upon as the dregs of humanity. Astonishingly, the Bastøy facility remained open for some years after the riot was quelled, and though it eventually did close, it exists again today, as a distinctly modern adult prison. “We discussed shooting it on the island, but it was too difficult to bring the young boys out there. There are murderers there. It’s been quite modernised. Things have been changed a bit, so the benefit of filming there wasn’t so great. And this is the prison system, Bastøy was the school system. That was the state, running a school.” Having seen the film, it’s hard to tell the difference. While the film certainly paints the children as the heroes, Holst’s film is intelligent enough to paint with shades of grey. While some of the children are sent to this frozen hell for virtually nothing – stealing a little money from a church charity box should not condemn a child to this – but others are hinted to have far darker pasts. Even the school staff – most notably Stellan Skarsgård’s formidable governor – seem to have contradictory intentions. King of Devil’s Island is visually stark, all snowy wastelands and bleak, grey interiors, devoid of colour and life. The soundtrack, however, is a more lively affair, perfectly encapsulating the hopelessness of the island, but also the spirit of the children. It even features Icelandic post-rock heroes Sigur Rós. “Actually, in the very beginning, I thought of having them compose the whole score. The problem is they’re like seven or eight people, and half of them are travelling around the world. They’re like a democracy, they all have to sit down and agree. They were a fan of a previous film I’d made, but we could never get everyone around the table. In the end I couldn’t wait any longer. They let us use part of a song that represented some of the atmosphere I really wanted. It’s uplifting, but melancholy as well. We melded that into Johan’s music”. That’ll be Johan Söderqvist, the man who composed the rest of the score. And, for a film that’s so concerned with atmosphere, music is crucially important. Luckily, Söderqvist’s score here is pitch-perfect, with no little help from Holst himself. “Johan composed everything once, and then we threw it away, and we made cues for everything twice. The first thing was either too big, or too minimalist, so we had to find the right balance. I was always very much in love with film, but music always came first for me, so I’m very involved in the creation of the music”. You’ll not see many films that make you feel as cold as King of Devil’s Island. We didn’t envy the poor young actors having to endure the shoot, but Holst never let conditions reach the levels of the actual Bastøy. “They had a good experience, I think. It was hard work for them, but I like to have a happy set. They had to be woken up early in the morning, it was cold and unpleasant… you can see in their breath. That gives something to the performance, so I wanted that”. The film is almost relentlessly bleak and hopeless, and you can’t help but side with the boys when they come to stand up for themselves, so to hear that even after they made their stand that things still didn’t get better for them is truly heartbreaking. “Some of the kids who were involved in the riot were trialled and sent to an adult prison for two or three years. The court-papers listed the damage to property, and the boys were charged for that. They were the ungrateful little bastards”. Holst, even decades removed, clearly feels strongly for these children and what happened to them. There’s even perhaps an element of shame about such a dark story from his nation’s past. It may have been brushed under the carpet at the time, but his film casts light on an important and forgotten part of Norwegian history. That it also happens to be a visually arresting, beautifully scored, masterfully performed prison movie about the unbreakable spirit of human nature and the way that power corrupts even the best of intentions, makes King of Devil’s Island one of the films of the year. Excellent. A real gem. Happened onto it thru online streaming video site. 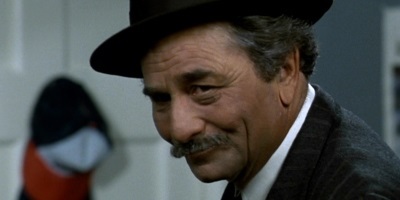 Terrific setting, photography, the score sets just the right tone and the casting was spot on. Every nation has it’s own stories such as this. As shameful as it is, it’s an excellent look at how societies deal with the unfortunate and downtrodden, and the younger criminal element. It’s also a terrific story of the resiliency of the human spirit. I really like this film.